The picturesque village of Lindos. A place that carries thousands of years of history, lies on the east coast of island, about 50 km south of the city of Rhodes. Romance and ancient culture is everywhere here. Walking through the narrow alleys of the village, the visitor arrives without realizing the ancient Acropolis of Lindos. It rises above the modern town, on top of a vertical cliff with height 116 meters. You may reach there, by an absolutely traditional way: on a donkey’s or mule’s back. Until nowadays are preserved many parts of that period, which the main ones are: The Doric Temple of Athena Lindia, the Castle of the Knights of St John, the Greek Orthodox Church of St John. It is worth seeing the old monasteries, St Dimitrios, St George, St Minas and Apostle Pavlos. 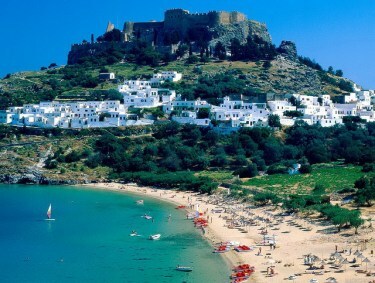 As for the village’s beaches, two shores in the same gulf, just below the Acropolis of Lindos, full of umbrellas and sun beds, offering to the guests a wide range of swimming and sunbathing facilities. Due the sea is very shallow here with sand, is ideal for families with small children. In Lindos village, the visitor may find restaurants, taverns, bars, cafeterias, mini markets and currency exchange. In case you have a yacht, supply facilities are available at Lindos port.